Somebody's been revisiting their father's vinyl record collection. That would be the dudes known as Spellcaster. 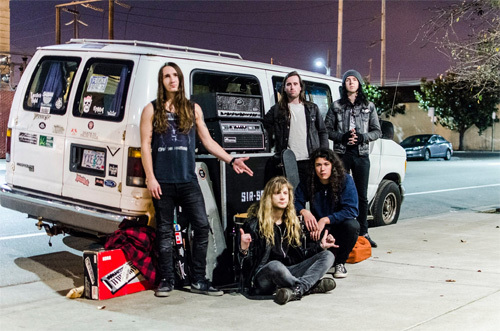 Hailing from Portland, Spellcaster plays traditional heavy metal, a nice combination of American speed metal with large hints of the New Wave of British Heavy Metal. They arrive with their third long-player, Night Hides The World. Essentially, Spellcaster gets everything right when it comes to their 21st century version of classic heavy metal. The band's strength are largely complete. Twin guitars deliver riffs, rhythm and groove, harmony, and fiesty leads. Underneath, the rhythm section propels their tunes with power and groove. When these two parts work together the Spellcaster sound is large, lush, and powerful. I can't overstate how effortlessly Spellcaster melds harmony and melody with rhythm and groove. Upon these layers, add the lead vocals and vocal arrangement, simply an echo of the inherent melody and harmony. Tyler Loney has a natural talent for clean melodic singing, and his range is strong and controlled. He's never screamo or harsh. At this third element and you have heavy metal dynamo, a well-oiled metal machine. As for the songs, they simply live and breathe all these things, and there's not a dull moment to be found. I had a friend who once said, "Beware songs that start slow." Spellcaster are masters at subtly, using quieter moments to draw you in before letting the riffs roar and the heavy metal swarm over you. The do this with the most excellent The Accuser and Betrayel (dig that groove). The summation for the album requires that great phrase, "It's all killer with no filler." Spellcaster's Night Hides The World delivers well-crafted and exceptionally entertaining "keep it true" melodic heavy metal. Quite recommended. 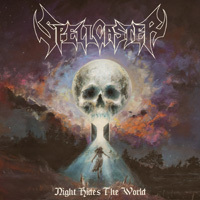 Spellcaster's Night Hides The World delivers well-crafted and exceptionally entertaining "keep it true" melodic heavy metal. Quite recommended.